Meetings are held on the 3rd Thursday of each month at 7 PM, at the Balboa Park Sports Complex, in the Gym Building, at 17015 Burbank Blvd, Encino, CA (just west of Balboa Blvd). Our membership reflects a cross section of woodworking interests and skill levels – both hobbyist and professional. 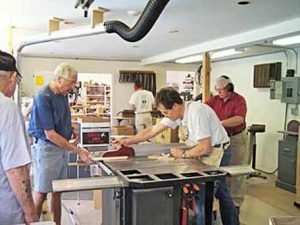 This is an open (not exclusive) club; anyone interested in woodworking is encouraged to attend, ask questions, become a member, join in discussions and enjoy the experience. Our members come from all around the Los Angeles area and, of course, all are very welcome. Please see our club flyer for more information on membership. If you have any questions regarding our group, please use our “Contact Us” form on this site, and someone will respond to your inquiry. Every meeting includes time for Show & Tell, sharing of the Monthly Challenge activity, and a Q & A session. In addition, we provide programs with invited experts, as well as our own members, demonstrating their expertise, and describing their processes.